Join my mailing list to receive news and updates! 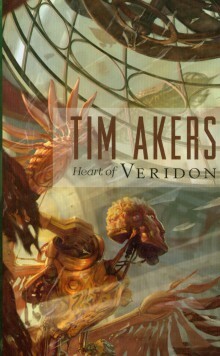 The first novel in Tim Akers’ captivating steampunk-noir series, The Burn Cycle. Captain-turned-criminal Jacob Burn is the unlikely survivor of two zepliner crashes. The first destroyed his career as a pilot, disgracing his nobleman father and ending his life of privilege. But the second threatens to destroy Burn’s whole world—Veridon, an ancient terraced city reborn through The Church of the Algorithm’s recent advances in mechanics, technology, and cog-work. Moments before the Glory of Day wrecked, a former underworld associate of Burn’s handed him an unusual and complicated cog for safekeeping. But the artifact-cog quickly draws Burn unwanted attention—too much of it, from too many of Veridon’s most powerful factions, casting doubt on even his closest allies. A far more dangerous and unpredictable enemy has also joined the manhunt, carving a bloody trail across the city, while Burn’s frantic search for answers only leads to more questions. At the heart of it all, the mysterious cog, which hides a secret potent enough to shake Veridon to its very core, and recast Burn’s entire existence.